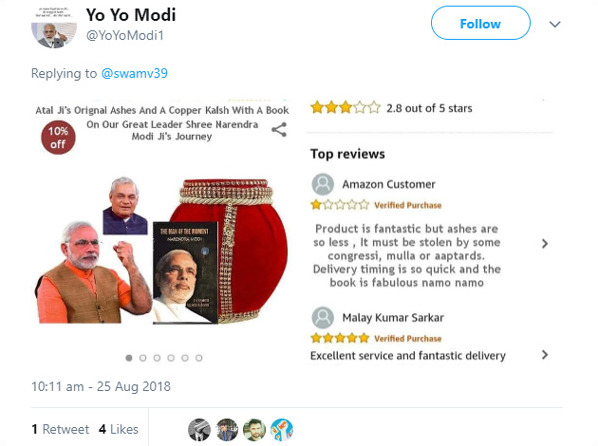 Bahujan Samaj Party’s social media influencer Devendra Jarariya recently shared a fake image on Twitter which claimed that ashes of former PM Atal Bihari Vajpayee are being sold on e-commerce website Amazon. Jarariya expressed shock and criticized the “politics” being played over Vajpayee’s death. Not just Jarariya, several other social media users fell for the photoshopped image and made it viral. 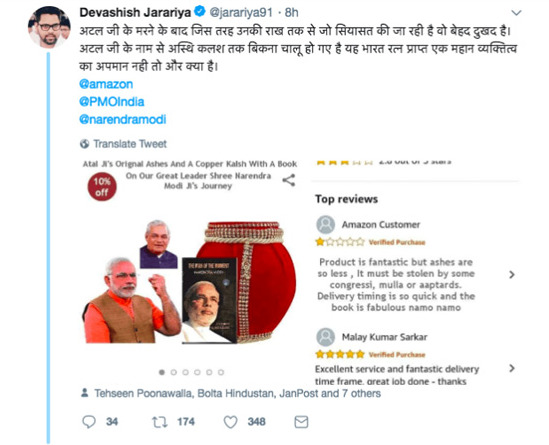 The fake post had two different photoshopped screenshots, one showed the fake product with name “Atal ji’s original ashes and a copper kalash with a book on our great leader shree Narendra Modi Ji’s journey”. 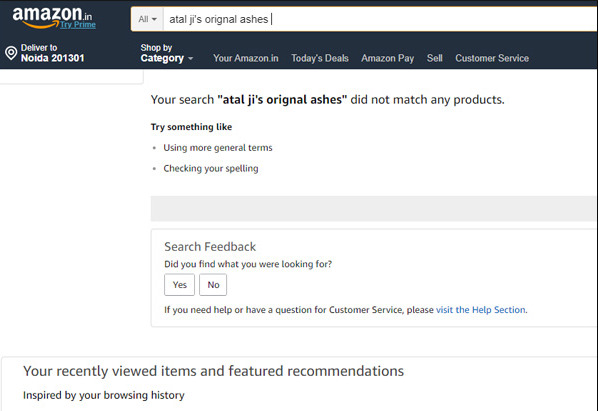 The othe screenshot showed “customer reviews” about the ashes. 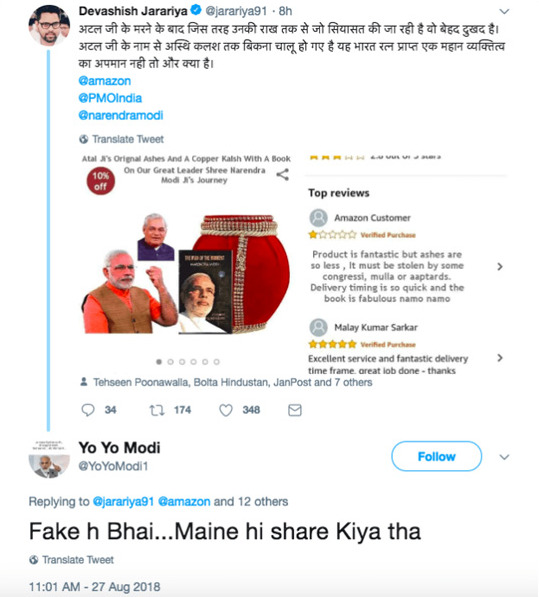 The photoshopped image appears to have been created by a Twitter handle @yoyomodi1, who replied to Jarariya’s owning its fabrication and calling it “fake”. 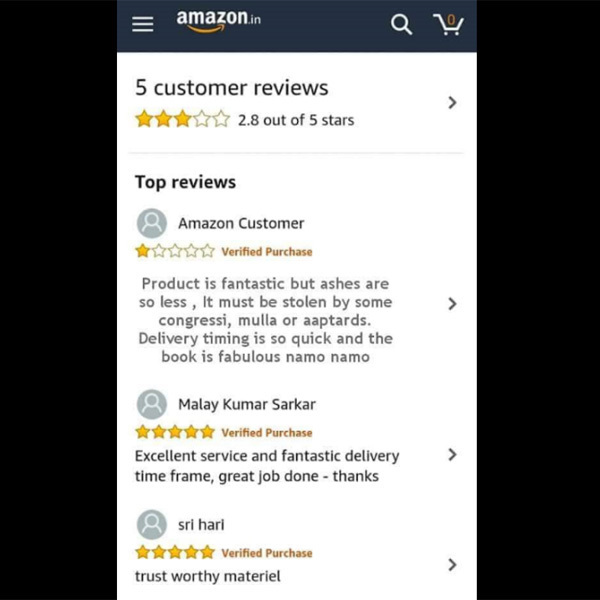 Since Internet is a crazy place and anything is possible, we did search for Vajpayee’s ashes on Amazon’s mobile app. However after browsing for sometime, we couldn’t find any product that matched our description. Now it can’t be possible that his ashes are only available to some exclusive buyers. On scrolling through @YoYoModi1’s account, it was found that the photoshopped screenshot was tweeted for the first time by him on 25 August. Times Fact Check team has found the claim of Vajpayee’s ashes being sold to be fake.